Spring is in full swing and with it comes OTS Tournament Pack 10! OTS Tournament Packs reintroduce some of the most popular tournament-level cards and are used as participation prizes or tournament prizing for Duelists entering local tournaments. 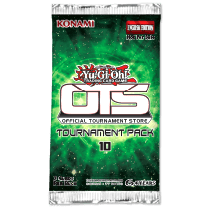 OTS Tournament Packs are not-for-sale items and are only provided EXCLUSIVELY to Konami’s Official Tournament Stores. Also, OTS Tournament Packs are one of the only ways Duelists can get ahold of Ultimate Rare cards!